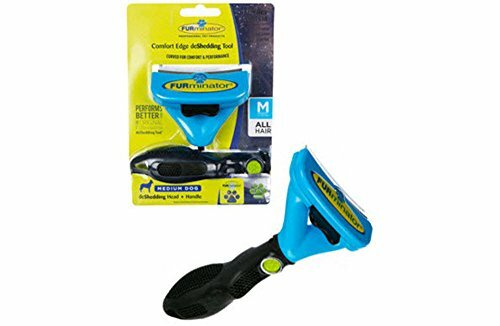 Minimize loose hair from shedding in your home with the help of the FURminator FURFLEX Comfort Edge Dog deShedding Tool. This easy-to-use grooming tool conforms to your pet's natural build and shape, and has proven to reduce loose hair from shedding by up to 90%! Customizable for different lengths and types of dog hair, it is the perfect tool for multi-pet homes. Features: •Conforms to pet's natural build and shape •Customizable for all pet hair lengths and types •Regular use stimulates natural oil production for healthy skin and coat •FURejector button releases hair with ease •Secure FURmLock technology Includes: Comfort Edge deShedding Head, FURFlex Handle Intended Pet(s): Cat Color: Yellow, Black Product Dimensions: 5 in x 2.5 in x 6.88 in Product Weight: .717 lb, .617 lb Instructions: The FURminator Comfort Edge deShedding Tool is recommended for use on shedding breeds.Consult your veterinarian if you are unsure if your pet has an undercoat. Use the Stainless steel DeShedding edge to reach through topcoat to safely and easily remove loose hair and undercoat without damaging the coat.